Engineered for high volume bagging operations that use automated twin bagging systems. Operating at speeds up to 150 linear feet per minute, Fischbein’s cost effective PBC-8000™ pinch bag closer is specifically engineered for high volume bagging operations that use automated twin bagging systems. 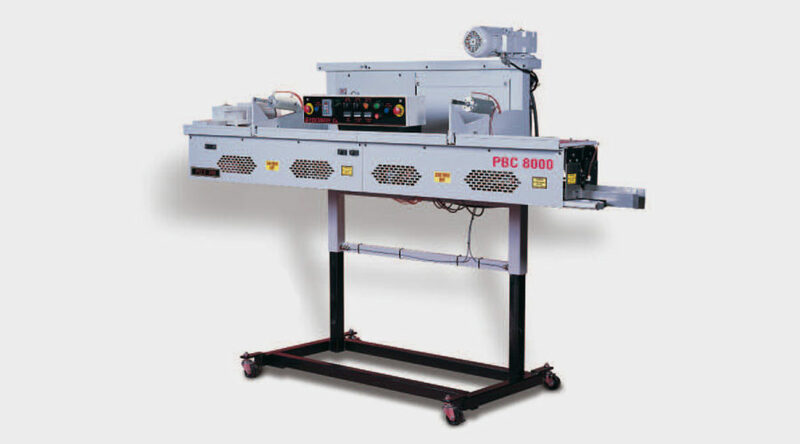 Designed to seal pre-glued, multi-wall pinch-style paper bags, the PBC 8000 does it faster, more efficiently and reliably than competitive models. Plus the PBC 8000 produces esthetic looking, sift-resistant closures which makes it perfect for food products, food additives, dry chemicals, fertilizers, pesticides and pet food products. PBC 8000 is engineered with a high-speed, maintenance free, direct drive system that maximizes production on automated bagging lines and an extended non-stick folder blade that results in bag closures unmatched for reliability. Operating speeds up to 150 feet per minute and the ability to seal pre-glued bag flaps up to 2 ¼ inches wide are available. The unit features high efficiency heaters that reduce energy requirements by 10 percent and deliver the precise amount of heat to the bag top, allowing for faster production with less energy use. The system’s mobile, height adjustable frame and Fischbein’s breakaway feature make maintenance safe and fast. Other innovative features include a safe, user friendly, low voltage control panel, air flow sensor, over-temperature shutdown sensor to prevent overheating and a bag jam sensor. The PBC 6000 is a valuable addition to any semi or fully automated bagging line.